Picture the scene – you walk inside a Fringe venue, and find no actors, no musicians, no dancers, in fact no performers at all. You'd be forgiven for wanting your money back. Unless, that is, your ticket is for an Architects of Air creation – because, as one critic wrote in 1992, 'if ever the show was the venue itself, this is it'. Nottingham-based company Architects of Air has been making large-scale inflatable structures for almost 20 years, and its latest venture, Mirazozo, is taking up residence at this year's Edinburgh Festival Fringe. 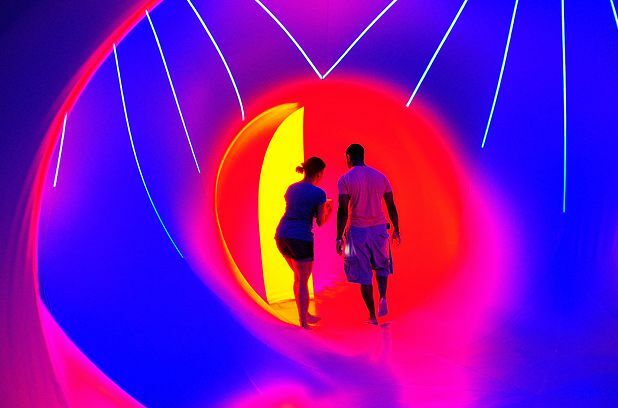 The vast 'luminarium' is made of thin, grey plastic with colourful translucent seams, to create a unique sensory experience of light and sound. To date, Architects of Air has created and toured 15 structures, winning fans the world over. For Parkinson, each structure is an 'experiment', pushing the boundaries of what both he and the materials are capable of. Which is pretty much how it all started, when Parkinson was working with a group of offenders in Nottingham during the early 1980s. They built an inflatable mattress, it had some flaws, he tried to improve upon it – and so it went on. Until in 1990, he created Eggopolis – a structure large enough to house a dance company. But pay they did, and in 1992, Architects of Air was born. Parkinson has been creating inflatable installations ever since, where the structure itself is the star of the show, rather than something happening inside it. To what does he attribute his creations' success? ● 0.5 millimetres - Mirazozo is made of material that's less than half a millimetre thick. ● 3 years - The average lifespan of an Architects of Air sculpture. ● 4 months - How long it took to make Mirazozo, with 6 people working on it full-time. ● 6 hours - How long it takes to assemble the structure on the first day. ● 20 minutes - The time that visitors have to explore the piece. ● 80 people - The maximum number allowed inside the structure at the same time. ● 1200sq metres - The amount of space that Mirazozo occupies. It is 48 metres long and 29 metres wide. Mirazozo, Assembly George Square, 0131 623 3030, 3–14 Aug, 10am–8.30pm; 15–29 Aug, 9.30am–8pm, £5. An awe-inspiring monument to the unexpected beauty of colour and light. Bring the family as the multi-sensory space welcomes and inspires. Take your map, remove your shoes, pass the airlock and wander freely through labyrinthine tunnels and cavernous domes or just lie back and enjoy the ambience. No two visits are alike.